Her rich cultural background has certainly had a great impact on the exquisite fashion style of Tia Cibani, who was born in North America, raised in Canada and had lived in China for quite a long period of time before debuting her eponymous brand’s spring/summer 2013 collection and immediately attracting loads of attention winning the Fashion Group International Rising Star Award in women’s wear. Inspired by the amazing works of famous Scottish artist Margaret Macdonald Mackintosh, she launched an utterly beautiful and romantic collection for the upcoming fall season comprising designs drenched in the Victorian style that we love so much. 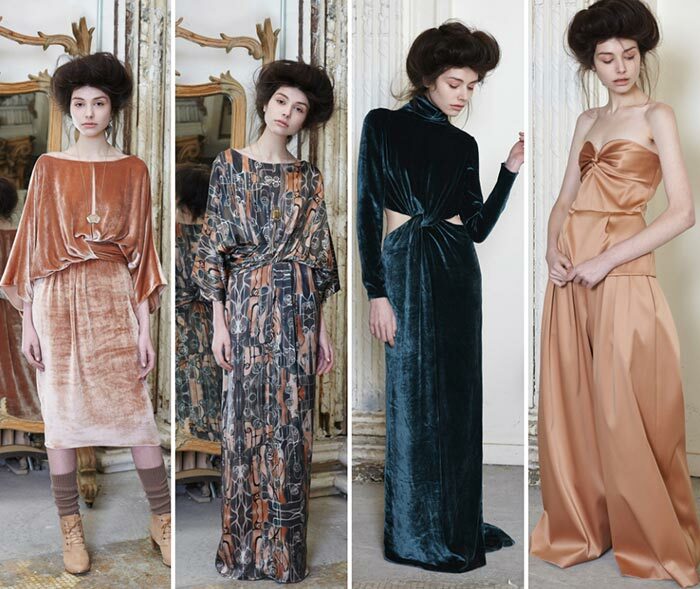 The Tia Cibani fall/winter 2015-2016 collection lookbook thoroughly transmits the romantic femininity these Art Nouveau textures, colors and silhouettes radiate. It’s impossible not to fall in love with these pretty clothing pieces at first sight, which mostly revolve around opulent velvet in earthen shades, weighty silk satin embellished with botanical prints with a painted glass effect, jacquards, cashmere knits and subtle motifs of lace appliqués decorating some of the bohemian and Victorian dresses and gowns we see within the lookbook. Whether it’s about the choice of the color palette or the shapes, everything is made to enchant and every small detail comes to put the focus on the artisanal skills of the designer. We do love the subdued autumnal and jewel color palette featuring Jasper, Topaz, Quartz and Jade, which add to the gorgeousness of the designs. While the majority of the looks focus on textural plays, interesting shapes and elaborate details, there are also a couple of designs with rich prints and patterns for those, who want to make a bigger sartorial statement come fall. Add subtle fringing, draping, delicate pleats, strapless designs and tulip silhouettes to all this, and you have one flabbergastingly gorgeous collection of fall clothing pieces, which will instantly land you in the spotlight wherever you go. 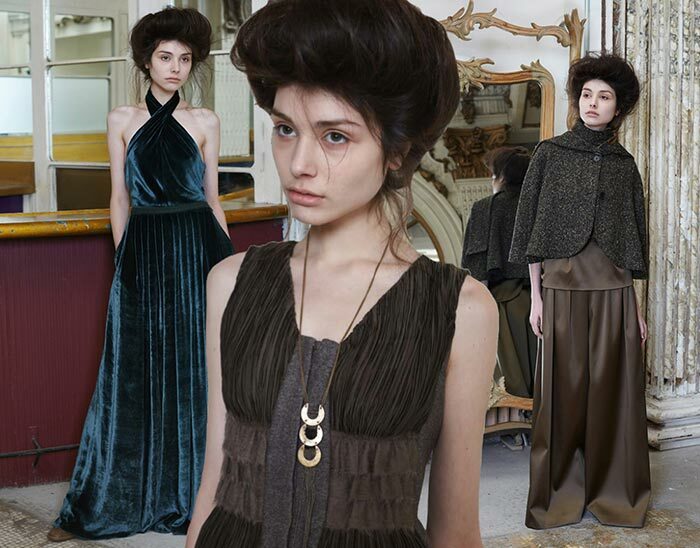 The Tia Cibani fall 2015 collection tackles the Victorian fashion trend best of all, which is among the top fall/ winter 2015-2016 fashion trends we can’t wait to rock. 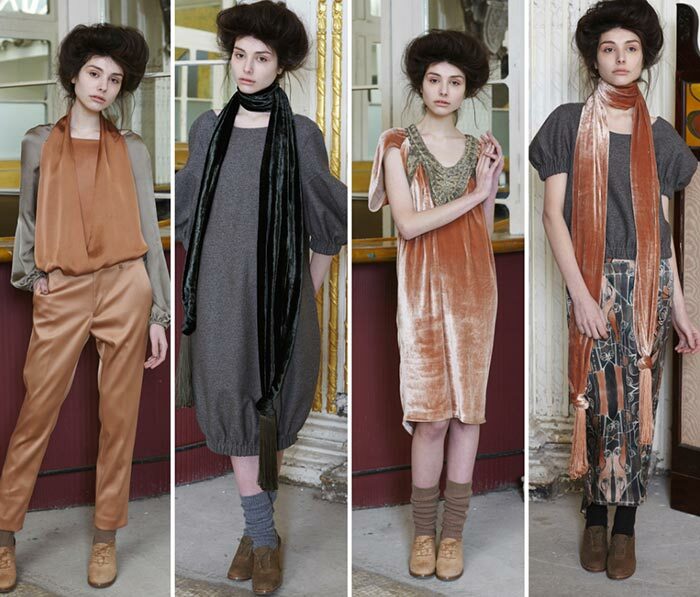 The style is depicted especially well in the velvet cinched wait draped dress with a lace collar, the velvet maxi jumpsuit with a halter neck, the maxi gown with waist cut-outs in Jasper, as well as moss boucle tearoom gown in Quartz and the velvet draped tulip dresses and gowns in Topaz. Duchesse satin is the next fabric making an appearance quite occasionally throughout the lookbook and looking especially divine when coming in Quartz and being the main material used for the elegant maxi trousers with side slits teamed with a monochrome blouse that is topped with a herringbone petal cape and a matching scarf, which kind of bring back the breath of the olden days. 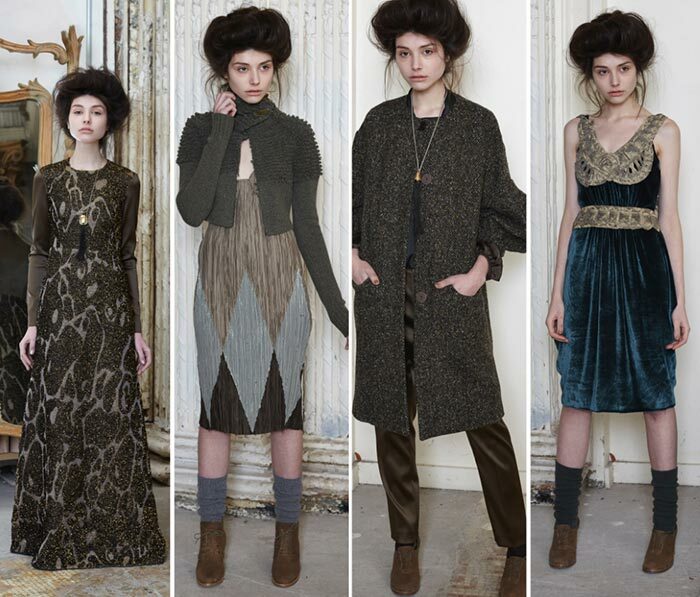 While there are a lot of perfectly tailored elegant two pieces, exquisite gowns and cocktail dresses within the Tia Cibani fall 2015 collection, we are also treated to warm and sassy winter essentials, such as the speckled herringbone coat and the moss knit boatneck sweater that is beautifully matched with a pleated skirt in Jade patchwork. All the looks are finished off with warm socks with suede shoes that both complement the designs and create a nice contrast with their romantic style. Yes, and we are definitely going to try that relaxed undone updo, which is a go-to hairstyle both for special occasions and effortless day-to-day looks.